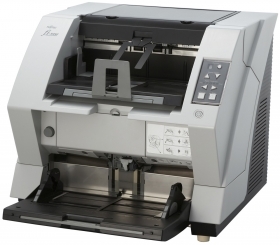 The fi-5950 is a production level scanner built for applications needing to scan high volumes reliably and quickly whilst minimising the pre and post processing tasks of the operator. The fi-5950 can scan a wide range of paper qualities varying in size from A8 to A3 and thicknesses from 31 to 209 g/m2 through the 500-sheet capacity hopper. New high speed CCD technology and latest image processing circuitry increase the overall processing speed. Even at resolutions of 300 dpi, 135 pages per minute or 270 images per minute can be continuously captured in colour or monochrome mode. At the same time, custom made CCD cameras enable brighter, more crisp and secure image capture of even oversized or extremely skewed documents. The fi-5950 provides selectable processing options through TWAIN or ISIS driver settings, which are supported by UW-SCSI and USB 2.0 interfaces that support auto-binarisation. The fi-5950 comes equipped with three individual ultrasonic sensors which greatly increase the reliability of double feed detection. This, together with superior paper processing and continuous document protection, ensures that if sticky or stapled documents are included in the batch, the sensors identify an overskew incident and interrupt the scanning process to prevent possible damage to the document. Other features include the ability to support up to 8 major languages through the control panel as well as in the driver and the manual. An active output stacking tray for neat batches helps prevent papersheets from curling. The fi-5950 emits incredibly low noise during operation at less than 55 dB. It features easy access to all consumables and paper path areas. When not in use the hopper module can be closed ensuring minimal desktop space is used as well as keeping the interior of the scanner free from dust. The fi-5950 has one of the lowest operating costs associated with it, minimising the cost per page.